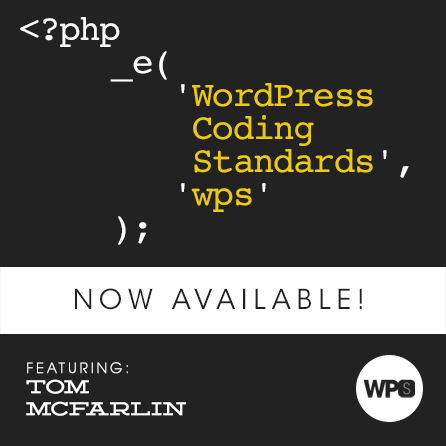 Learn how to remove the “fingerprints” from your code and implement the sane coding standards adopted by WordPress. Tom McFarlin will walk us through why code standards are good for the planet and how you can best start following them in your own code. So you’re beginning to learn your way around building products and/or services for WordPress. Perhaps you’ve read a number of tutorials, been through the Codex, built a couple of themes or plugins, and now you’re ready to begin working on a project for client or with a team. There are a lot of variables to take into consideration all of which range from project management to design from specification to development. Though each of those are important in their own regard, there’s one thing that you can expect to be constant throughout your projects and that’s writing code. For many, when you first begin working in software development – or in any form of writing code – it’s often that many of us think that if we can just get the project working, then we’ve done our part. But the longer you work in the field, the more people with which you work, and the larger the project, the more you learn that it’s *not* enough just to get it working. Instead, there’s a level of quality that must be built into into code that makes the project work. Yes, it helps to know how to plan the architecture of the project and yes, it helps to have some experience with design – be it object-oriented or not – but it also helps to know the coding standards of the language and platform of which you’re working. WordPress, like many other languages, platforms, and frameworks, has its own set of coding standards and if you’re going to be a professional WordPress developer, then it helps to under them and to apply them in your work. We’ll also talk about where we can find resources that will help us in terms of WordPress, how this can affect the bottom line of any software-based business, how they contribute to better debugging, code modification, and ideally how they can make our jobs (which are already stressful enough), a little bit easier. With that said, we look forward to seeing you at the session. Tom is eager to cover all of the above and take questions, comments, and more from those who attend. Tom runs Pressware – an Atlanta-based WordPress development company that specializes in building custom solutions for others.When not working, you’re likely to find Tom hanging out with his wife, two kids, and their two dogs, or running, or doing something related to music. He blogs daily at TomMcFarlin.com, tweets frequently as @tommcfarlin, and also shares fun GIFs the represent the day in the life of a programmer at DevPractic.es.